Whilst we all love to stretch out and wander around an enormous home tour, or drool over a cool cutting edge interior, sometimes we crave a bit of cosy home comfort. The nesting instinct in us appreciates the beauty of a more compact bolthole, with cushiony furnishings and uplifting colour. 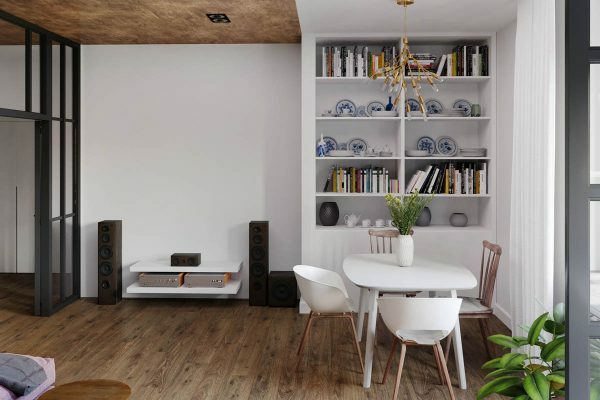 Due to the modest proportions of this riverside home, the walls have been painted white to increase the sense of space and light. The apartment interior was designed for a young family with three children, so the added chaise section of the sofa provides additional sitting space. In the same compact space, a four place dining table sits beneath an eye-catching pendant light. The dining chairs are mismatched to create an interesting eclectic look. 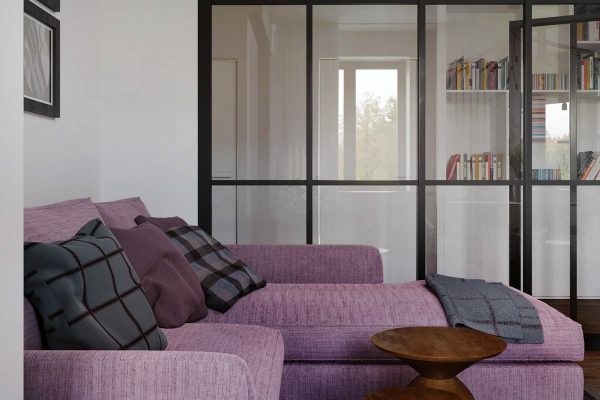 The sofa is upholstered in a warm and inviting purple fabric, which has been coupled with squared pattern throw cushions and a matching blanket to snuggle in. The purple modern sofa sits on top of a large bordered grey rug, which both warms up the floor for cold toes and defines the visual boundary of the living room from the dining area.